Tom Wilson’s NHL highlight reels typically consist of toe-to-toe slugfests with fellow enforcers or borderline hits to the head of unsuspecting players. But lately, they’ve also featured a few goals and assists. Love him or hate him, Wilson has evolved into something of an elite power forward with the Washington Capitals lately while producing at a clip of .91 points-per-game so far this season. Sure, he’s played just 23 games as of Jan. 10th due to injuries and a lengthy suspension, but he’s managed to come up with 13 goals and eight assists. He hasn’t been hurting the team in his own end either with a plus-12 rating. It may be hard to believe, but if the 24-year-old native of Toronto, Ontario remains healthy and doesn’t run afoul of the rules for the rest of the year, he’s on pace for 36 goals and 58 points in 63 outings. If he hadn’t missed 19 games already he’d possibly be staring down a 40-goal campaign. It could be argued Wilson should be helping the Capitals’ offense out since he’s signed to a $31 million deal over six years. But other than Caps’ fans, many are still wondering how he landed the sizable contract in the first place. In the meantime, Wilson’s answering those critics with his play this season. No matter what he achieves on the ice though, there will always be those who view him as nothing more than a goon. 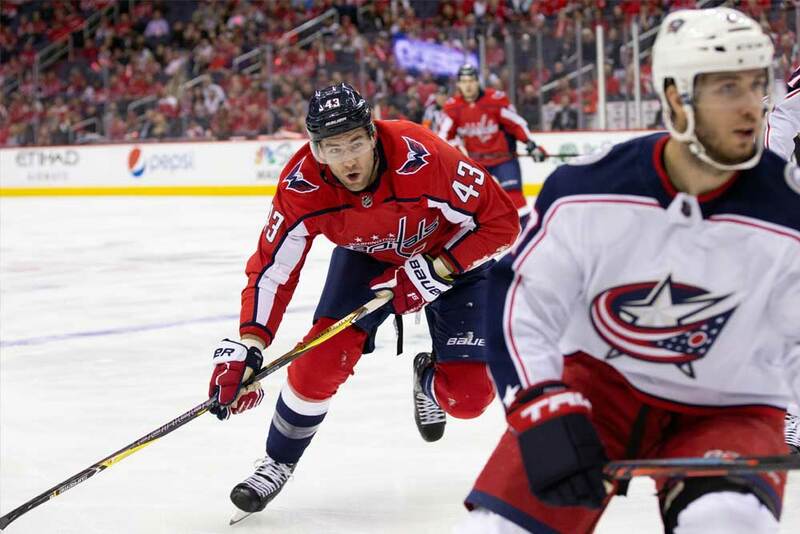 Unfortunately, Wilson’s given them plenty of ammunition to support that opinion of him, but Capitals’ general manager Brian MacLellan believes there’s a lot more to the 6-foot-4-inch, 220 lb player than meets the eye. There’s no doubt Wilson’s claim to fame is his somewhat reckless physical play, but MacLellan believes he’s good enough to be a top-line presence in the NHL and also brings plenty of leadership qualities to the team. And that’s why he rewarded him with such a substantial contract last summer. It would be slightly difficult to debate MacLellan’s point of view considering the Capitals won the Stanley Cup for the first time last year with Wilson’s play helping them achieve the feat. The GM believes in the player as does head coach Todd Reirden and that’s all that really matters regardless of Wilson’s reputation around the league. If the Capitals didn’t see anything positive in him as a youngster, it’s doubtful they would have taken Wilson with the 16th overall pick in the 2012 NHL Entry Draft. MacLellan told NBC Sports the team’s scouts thought highly of Wilson’s character, skating ability and physical presence and also believed he had some untapped offensive potential in his hands. From 2010 to 2012 Wilson didn’t display much in the scoring department while playing junior hockey with the Plymouth Whalers of the Ontario Hockey League. He chipped in with 12 goals and 21 assists in 77 games in his first two seasons and served 212 minutes in penalties. However, he started to produce in the 2011/12 playoffs with seven goals and 13 points in 13 outings. Wilson’s confidence around the net grew and he posted 23 goals and 58 points in 48 games the next season while still serving over 100 minutes in penalties. His scoring touch didn’t desert him in the postseason either as he added another nine goals and 17 points in a dozen contests. Even though he could put the puck in the net at a decent rate, the Capitals didn’t draft him for his scoring touch. After playing a few games in the AHL with the Hershey Bears, the Capitals called Wilson up during the 2012/13 playoffs as they felt they needed some aggression. The call-up fit the bill and Wilson has been with the team ever since. Adam Oates was Washington’s head coach at the time and he didn’t really give Wilson the chance to show what he could do in his rookie year. Oates played him just under eight minutes per game and Wilson finished the season with three goals and 10 points as a fourth-liner in 82 games with 151 penalty minutes. He soon became known for his physical play and fighting ability, but not much else. Even though he played in 15 fewer games as a sophomore, Wilson’s production rose to four goals and 17 points the next season as did his penalty minutes at 172. He was also rewarded with an average of three more minutes of ice time per night. His third and fourth seasons were quite similar as Wilson managed to play all 82 games both years and scored seven goals each season. He was now playing close to 13 minutes per game, but wasn’t much of a factor in the playoffs as the Capitals performed their annual disappearing act in the second round. In fact, it wasn’t until 2017/18 when former head coach Barry Trotz decided to experiment with Wilson as a top-six forward. The youngster soon found himself playing on the right-wing with Evgeny Kuznetsov and Alex Ovechkin to help them out defensively. Wilson also added a lot of exuberance, grit and energy to the pair and finished the season with 14 goals and 35 points in 78 games and was a plus-10. He also served a career-high 187 minutes in penalties. Wilson continued to contribute in last year’s run to the Stanley Cup by adding added five goals and 10 helpers in 21 playoff encounters. Wilson was quickly brought back to earth in the 2018/19 preseason though when he was dealt a 20-game suspension for an illegal hit to the head of Oskar Sundqvist, which was later reduced to 14 games after an appeal. Some fans believed the ban would have an affect on the way Wilson plays the game, but that hasn’t been the the case. He’s still playing on the edge as usual and doesn’t hesitate to drop the gloves when he feels it’s necessary. Many teams won’t bother trying to challenge Wilson since it generally means they’d have to ice an enforcer against the likes of Ovechkin and Kuznetsov and the odds of them getting burned increase greatly. Wilson’s definitely no choir boy, but he’s definitely in tune with today’s NHL. He’s succeeding most people’s expectations, perhaps other than his own and his general manager’s.